We start by getting to know everyone. Bananas is smack talker, as is UFC fighter CM Punk. Smashley is Smashley. Kamerion is a former NFL linebacker, whose introduction is vague stuff about competition. Next we’re reminded that Jordan is fueled by people thinking he can’t do it because of his partial hand. Then we meet track and field star Louise. She knows Lolo from competition. Lolo won. Louise isn’t worried about the Champs, writes them off as reality TV stars. Lolo is a hurdler and bobsledder who “should be on the beach” as this is her offseason, but she wants to compete. Wes reminds us he’s good at everything. Camila reminds us she never gives up. Veronica hasn’t done this in a while and wonders if that lack of alliance with other Champs will hurt her. Ashley K. considers the Challenge its own sport. Darrell is ready. Cara Maria has proved to herself she can do anything. CT is good. 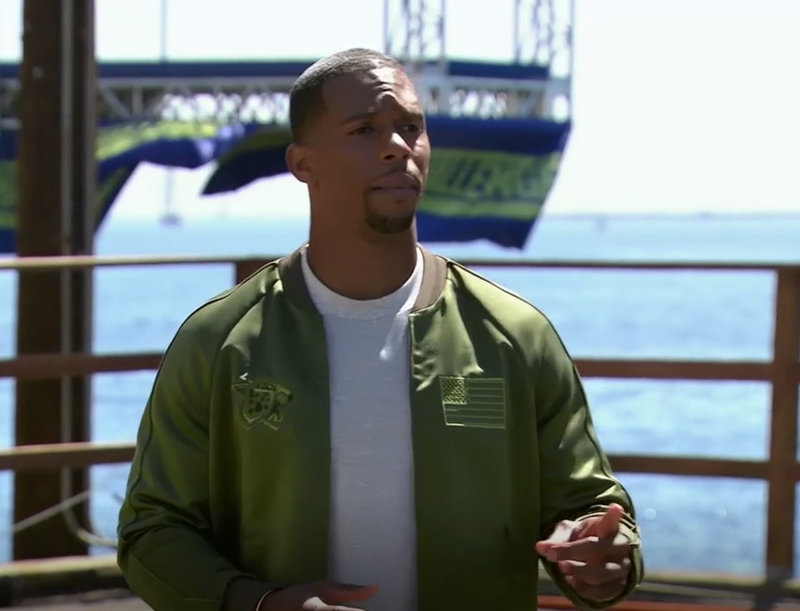 We meet former New York Giants Wide Receiver Victor Cruz in sunny Los Angeles. He then introduces the Pros that think they can beat the Champs at their own game. Former NFL player you’ve heard of, Shawne “Light Out” Merriman is ready to give the Challenge Champs a rude awakening. Gus is an openly gay freestyle skier. Tia is a 19-year-old surfer who sounds as chill as a surfer, but not quite as chill as snowboarder Louie. Lindsey races snowboard cross. She knows Gus from the Sochi Olympics. Candice is a former WNBA player and Challenge watcher! She likes Darrell because she’s a fan. At the start of each challenge, each team nominates a team captain. If your team wins, you get $5,000 for your charity. If your team loses, you’re automatically sent into elimination. Lolo and Shawne start smack talking about how they are actual athletes. Bananas reminds them that this is their territory. Their sport. It’s banter and not a fight, but it’s clear that Lolo isn’t amused by Bananas’s antics. Each week they will test a special skill. This week it’s agility and it will be tested in the challenge game Against the Ropes. We saw this on Season 25, Free Agents in 2014. CT and Camila were there. This time, the discs are smaller at the bottom of the rope and they will play in heats. The team that gets the most people from one platform, through the hanging ropes to the other, wins. It’s a female elimination week, so captains must be female. Louise volunteers. She knows she’ll seem like the polite British one, but maybe she rightly thinks that if she volunteers and wins, she gets to avoid being captain the rest of the time. Bananas asks The Champs for volunteers. Smashley jumps on it. Bananas says Smashley is two weeks out of getting breast enhancement surgery, which won’t be good for her game. The teams discuss strategy. Bananas wants to remind everyone that he’s played before. The Pros want to divide by their team up by weight. Champs Heat #1: Cara Maria, Camila, Wes, Bananas, Jordan. Wes falls. With one minute left of the five given, the Champs push. Only Camila gets across though. Pros Heat #1: Shawne, Tia, Candice, Gus, Louise. Shawne goes down, followed by Candice. Gus is hanging by the tiny ring at the bottom of the rope and he pulled himself up. Tia, Gus and Louise make it. Because the Pros are up 3-1, they go next. Pros Heat #2: CM Punk, Lolo, Kamerion, Louie, Lindsay. They are organized, but slow. They only get Kamerion across. Champs Heat #2: CT, Darrell, Smashley, Ashley K., Veronica. They need four to make it across to win. Smashley and CT drop. The rest need to make it in order to tie. Veronica is short so reaching for this rope isn’t looking good. She drops. Pros win (15 points each). Back at the house, Victor Cruz tells everyone that there are no free rides. The Champs have to decide who goes against losing captain Smashley. But the Pros have an elimination, too. Louise is safe and gets to nominate someone. The rest of her team picks the opponent. This makes sense, considering the short 6-episode format. On the Pros side, Lolo gives a speech about how her charity is HER charity and she wants to win money for them. Louise doesn’t appreciate Lolo acting like her charity is more important than others. The Pros also want to be professional about this process. Candice nominates herself because she fell. The guys bring up the idea of picking names out of a hat as a fair way to pick who Candice goes against. They write names on a lime and give it to team captain Louise. Lolo is picked and she’s not pleased. Lolo doesn’t like that her charity may not see any money. Gus reminds her that this was what they agreed on as a fair way to do it. Lolo gets in a verbal fight with Gus (10 points each) because Gus also brings up that all of their charities matter. The Champs are loving watching them have to deal with the game. On their side, they threw in Veronica because no one remembers her. By the way, Louise may have picked whatever lime and just said Lolo’s name. Or at least that’s what she tells cameras. Possible Nelson-level snake move! Voting time shows Veronica describing herself accurately as a born-again rookie. On the Pros side, CT and Jordan are pumped to see Candice and Lolo going against each other, describing them as the best female players on that team. Before elimination, it’s bowling night! Kamerion is happy that bowling isn’t the challenge because he is bad at it. Jordan gets Lolo a water with a ton of limes. Lolo likes the joke and may even find Jordan attractive? Bananas talks to Lolo about how the lime draw was decided. Bananas is loving that these Pros aren’t in tune with how to play the drama portion. Elimination time in the Arena! The game is another one from Free Agents (the elimination that Jordan went home on), it’s called Pull No Punches. Each competitor has a wall they have to kick and punch to get holes into to climb to get to their bell at the top. This time, the walls are thicker. Champs go first. Smashley takes a lead, but falls. But the holes are now there for her and Smashley gets up there first for the win (25 points). Now it’s time for the Pros. Lolo is worried about Candice’s height advantage. Lolo knows how to punch the wall and beats Candice easily, (25 points for Lolo). Victor Cruz congratulates the winners and announces Candice and Veronica will get $1,000 for their charities. Lolo is happy that Candice’s charity gets some money. Veronica is happy she came out of wherever she has been hiding these years and just wishes she had done better. I didn’t mention the charities at all, but they are all playing for great causes. What is Veronica doing these days? Everyone is afraid of Lolo. Especially Gus. But not Jordan. Is Lolo a virgin? If so, can Jordan change that!??! Lolo and Louise feud will seemingly go on all season. In general, the preview of the season is crazy. CM Punk vs. Bananas. Wes calling for Bananas to face him in an elimination. Lindsey asking to sub in for a player in the arena. How is this only 5 more episodes? It looks like this could be very action-packed and amazing.